If you have raw wildflower honey this works great. It’s a good choice because the bees foraged on everything they could to make this honey and the health benefits you can get are magnificent. The nectarines will caramelize and give a charred flavor to the rich cheese and sweet honey. 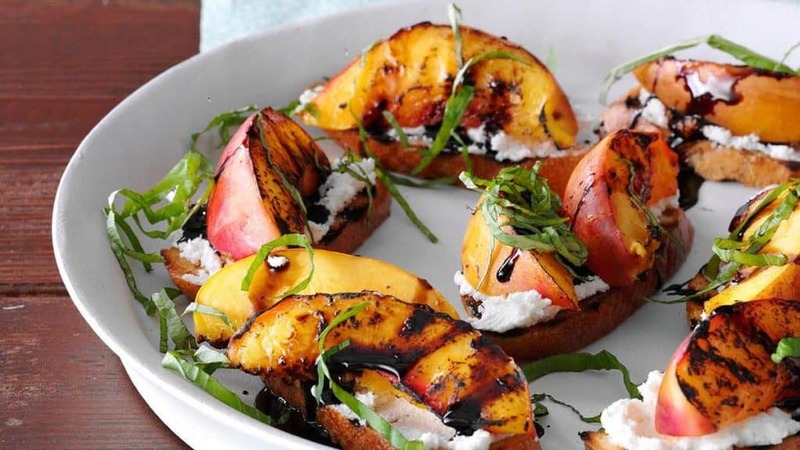 You can also substitute nectarines with peaches or roast pears or apples and using the same preparation. Below are the ingredients and how to prepare it. Step 1: Preheat the grill on medium-high heat. Step 2: In a small bowl, combine 1 teaspoon water and 1 teaspoon honey. Rub mixture over cut sides of nectarines. Step 3: Place the nectarines on grill grates coated with cooking spray; grill and uncovered for 2 minutes on each side. Remove from the grill and cut each piece into 4 sections. Step 4: Coat bread with cooking spray. Arrange on grill grates and grill 1 minute on 1 side or until lightly browned. Remove from grill and reduce grill heat to medium. Step 5: Divide nectarines evenly over toasted sides of bread, then top evenly with cheese. Arrange on grill grates then grill and covered for 1 1/2 minutes or until cheese softens and bread is toasted on bottom. Arrange toasts on a platter and drizzle with the remaining 5 teaspoons of honey. Drizzle with balsamic glaze. Garnish with microgreens or sprouts, if desired. Serve immediately.